Cam's Cinematic Episodes: Yargh! A Trailer Full Of PIRATES Off The Port Bow! Yargh! A Trailer Full Of PIRATES Off The Port Bow! Greetings my disciples. Trust your weekend was most excellent. Well, I'm back with another blithering blog entry. Today we're going to take a little journey to... The World's End. And by that I'm referring to the third and final (?) entry in the stunningly successful Pirates Of The Caribbean franchise, At World's End. The marketing blitz hit a high point today with the release of the newest trailer, and it is a doozy. You all can see it pretty much anywhere on the internet right now (www.ew.com, www.aintitcool.com, www.mania.com, www.alongcamequilting.com...), and I recommend you do before plowing onwards into the mountain of minutiae that is today's entry. Now, when last we left the series, with last summer's Dead Man's Chest, things were looking pretty grim. Jack Sparrow (Johnny Depp) had been devour ed by the giant squid monster ruled by Davy Jones (Bill Nighy - Pictured), Will Turner (Orlando Bloom) and Elizabeth Swann (Keira Knightley) were going through a rough patch, Norrington (Jack Davenport) had taken off with Jones' heart, and poor Bootstrap Bill (Stellan Skarsgard) seemed doomed to eternal damnation. 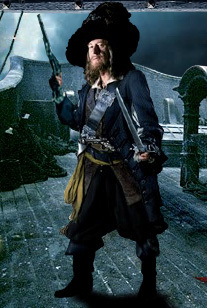 Then, they announced that Barbossa (Geoffrey Rush) was back and would be taking command of The Black Pearl. Why, it was all too much drama for a person to take! Finally, on May 25th we will have all our questions answered and hopefully all the threads will be tied into a neat little package. Or it could end like The Matrix: Revolutions. Annoyed confusion leading to pouting and emotional hysteria. I have faith, however, that this one will work due to the quality of Dead Man's Chest. "Hold up!" you're thinking! "That movie was a big ol' let-down!" Yes, many people felt that the second entry was a less than successful follow-up... But I'm not one of them! HA! After an admittedly bumpy first act I thought the story really took flight. I thought that Davy Jones was a truly wonderful (and potentially classic) villain who was far more interesting than Barbossa from the first film. I also liked that the filmmakers trusted the audience to jump into the story without unnecessary exposition reminding us what happened in the first film. I thought every one of the comic set-pieces worked nicely, and the action moments were equal to, if not superior to those which came before. The actors really fell back into the characters nicely and really worked to develop them as opposed to just running in place. I also felt that returning director Gore Verbinski perfectly matched the tone of the first film, while setting the bar even higher. Hell, I even thought that the cliffhanger ending worked out really well, and I hate abrupt endings (Yes, Matrix Reloaded, I'm talking to you! )Plus, the kraken was just plain cool. I'm also pleased to see Chow Yun-Fat in an American film role that may actually be memorable. After truly horrific films like Bulletproof Monk and The Corruptor I had lost faith that Yun-Fat would ever get any really good material in fickle western cinema. I mean, come on, this guy was amazing in Hard Boiled! He deserves A-quality material for that film alone! Well, regardless, it looks like he's got a good part here, as the pirate Captain Sao Feng (Pictured). I do have to mention, though, that I hope this is the last film of the series. The Disney honchos have hinted at multiple more installments (And after the 400 million plus gross of Dead Man's Chest who can blame them), while Verbinski and assorted cast have said "NAY!". I'd like this one to end up as a trilogy. For once let a film series end before it slowly dies from overexposure and familiarity. Only time, and The World's End's profits, will tell. Anyways, consider me psyched. This is the film I'm most looking forward to this summer... After Spider-Man 3 and Fantastic Four: Rise Of The Silver Surfer that is. I'm still a little confused about how Barbossa came back to life but I'm sure a perceptive 8 year old could answer tha t question. So, see you on May 25th when the goons from Disney order us from our homes to see this film. Disney don't play around when it comes to aggressive marketing... Yargh. Well, I suppose I shouldn't be surprised. It was announced the other day that, due to its staggering success, a sequel to 300 was in the planning stages. Perhaps I'm being overly cynical. If there's one thing Hollywood cares about it's quality over anything else. And if you believe that then I've got some magic beans for sale. My hopes are lifted, however, by the news that Frank Miller (Pictured... On the right), the artist/writer who cre ated the graphic novel 300, as well as Sin City, Dark Knight Returns, etc., is going to be a key figure in putting the follow-up together. While the details are vague at best (I'm unclear whether Miller will make a graphic novel that will then be adapted, or simply work on a script and visual ideas), it appears that the next film will be based on another classic Greek story. Perhaps the eternal fire or something. Regardless, while I mock creating a sequel to films such as this simply for the sake of profit, I'll remain cautiously optimistic about this one. When they announce director Zack Snyder's involvement I'll be less cautious. Well, there you all go. I'll be back soon with another fun-filled, time-wasting, zip-trippin' entry!